Astell & Kern AK120 gets official UK launch | What Hi-Fi? Astell & Kern has officially launched its two portable music players, the AK100 and flagship AK120, in the UK. The premium devices bring portable high-resolution audio playback, plenty of storage space and also the ability to work as an external DAC for any home system thanks to the digital optical audio connection. 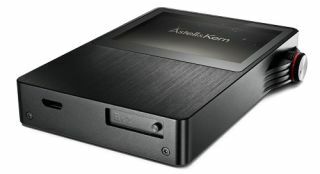 Astell & Kern, the high-end arm of long-established PMP manufacturer, iRiver, has an enviable reputation amongst portable audio enthusiasts and both the flagship AK120 and the AK100 will now be distributed in the UK by Computers Unlimited. The news comes hot-on-the-heels of Sony's new high-res audio range, which includes the Sony F886 Walkman and an intruguing prototype high-res Walkman product. It's fair to say A&K operates a step above in terms of spec, however. The new AK120 sports dual Wolfson 8740 DAC chips, and is the first portable player to use such a chip in a dual mono set-up. High-res audio files right up to 24-bit/192kHz are supported, with thorough file support including AAC, AIFF, ALAC, FLAC, MP3 and WAV. There's a 64GB on-board memory, plus room for two microSD cards for a maxiumum 192GB. The AK120 has a USB connection for simple drag and drop music file transfers from computer. The device itself is compact but solidly built with a brushed aluminium finish, 2.4in IPS touchscreen and an analogue-style volume control knob on one corner. A headphone jack and optical in/out completes the unit. Inside the AK120 is a 2350mAH battery, which A&K says should be good for up to 14 hours of music playback, depending on use. Seriously high-end devices, they naturally come with serious price tags. The Astell & Kern AK100 is set to come in around £570, while the AK120 is yours for £1100.